Bring a bit of the outdoors inside using the Ancient Graffiti Copper Metal Owl Wall Art. This stylized bird lends a fantastic look to any setting, with its three dimensional accents and copper hues. Its solid steel construction forms a lasting adornment, and the slight arch and raised wing add drama to your wall. The top of the unit folds downward to create a three dimensional beak which sits between the impressed eyes, and tufts to mimic a horned owl. A keyhole hanger on the back of the piece helps it attach to a wall in moments, and the steel body can be used indoors or outside for versatility. The verdigris and copper hues create a unique finish, which enhances any setting. 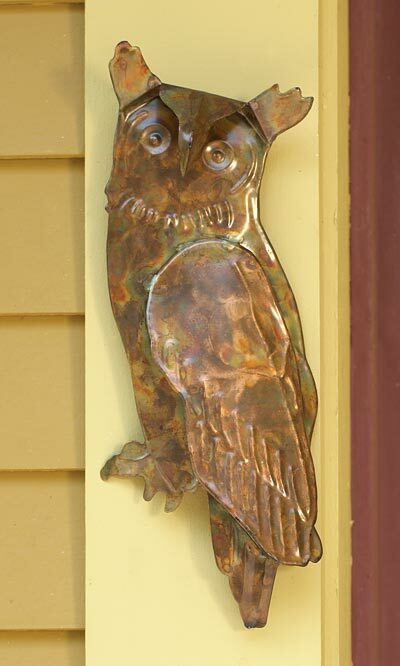 Celebrate the natural world with this Copper Metal Owl Wall Art.